Feel the energy of an unexplored galaxy with this 5 reel slot game adventure through time and space - click to see UK slots. With 80 different levels and coin value combinations available this a game to keep the player guessing. NetEnt delivers high-quality video slots for little over 20 years now and is one of the forerunners of this market. Several of their games have been awarded and the development team always shows a lot of innovations and creativity. NetEnt provides flexible digital casino solutions, always adapting to the newest changes in technology. They can pride themselves of a large number of the world's most prominent casino operators they serve and their very high-quality video slots. You can deposit at our casino to play slot games created by NetEnt. Sparks offers an electronic-themed with beautiful aesthetics and a soothing soundtrack providing an intriguing gameplay experience. The lower value symbols of this game are A, Q, K, J and 10 and the higher value symbols are sparky lines that remind a little of either a flower, atoms or tiny explosions of different colours; orange, green, purple, red and blue. All of the symbols look like the lighting effects that can be achieved with long-exposure photography and mesmerizing with their neon colours. We have a list for new players to play best slots now! You will see 5 reels and three lines on a simple background colour. With a minimum bet of just 20p and a maximum of up to £400 you can see the reels spin with attractive symbols that live on them. Land a W in a blue sphere and you will discover the wild that can replace anything except for the Expanding Cloning wild. This Expanding Cloning Wild is represented by a W in a golden electrical sphere and can only be found on reel two and four. It has a very exciting feature as it will expand up, down or even both ways. But if you’re unlucky it might not expand at all. It will then duplicate the symbol on the left and place it to its right giving you a guaranteed match of 3 symbols. If this wild did expand then it will also duplicate the symbols to the left of the expanded wild. It will also give you the chance to get a five of a kind win if you land two of these wilds in the same position on the reels in the same spin. With 20 paylines and the exciting wild features, this game can turn very lucrative very quickly. There is also an exciting plus feature in the settings where you can opt between the standard left to right paylines, right to left paylines or even both. Now while this will not increase or change the chances and outcomes on either one of the options it still gives a nice twist to the gameplay adding a lot of replay value to it. This online slot offers a very hypnotizing aesthetic that will catch you with its simple beauty of the sparky lines. The payline options add a lot of variety to the gameplay with just one change to the settings. The Expanding Cloning Wild is an interesting feature that can turn a spin very lucrative and also adds a lot of excitement to the game. 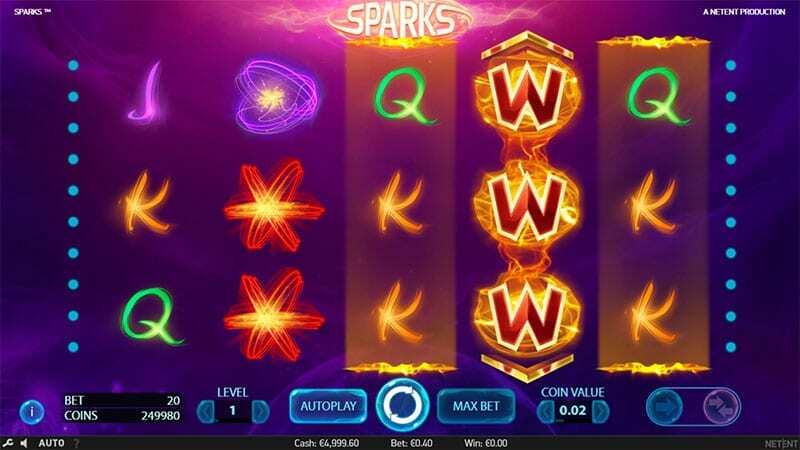 If you like beautiful slot games with a little bit of an energetic feel to it then lean back and play a round of Sparks while you watch in awe those shiny sparkly lines spin through the reels.